What started off as a dream 5 years ago became a reality as Brew Dog officially opened their new world class craft brewery in Ellon, Aberdeeshire on Saturday 19th January. The new, state of the art Brew Dog eco-brewery sits amidst the harsh and rugged landscape of North East Scotland. It is also the world’s first ever crowd funded brewery and the project is only a reality because of all the Equity Punks who invested in the company. All of the equipment is cutting edge in the craft beer world: from a revolutionary centrifuge so that they can completely avoid filtration, to a patented ‘Hop Cannon’ developed with the manufacturer – everything at the new brewery is focussed on making completely awesome beers. The brand new facility includes a state of the art brew house, fermenters, bottling line and all relevant ancillary plant which allows the exponential ramping up of production as such brands as Punk IPA, Trashy Blond, Tokyo, Tactical Nuclear Penguin, Dead Pony Club etc. 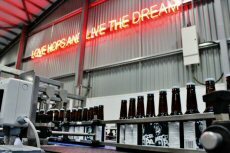 The contract for the 15,000 bottles per hour beer bottling line was awarded to Enterprise Tondelli, with the filler being free issued by Brew Dog for incorporation into the scheme. Particular attention was taken to produce an ergonomic line with good operator and materials access and optimised staffing levels. To optimise staffing levels for instance one operator is located between the filler and the labeller so they can monitor both machines thus reducing unit costs. Easy access to all parts of the line means that the operators can quickly reach any area thus reducing downtime and increasing efficiency. Additionally the line design focused on the floor falls, drainage and floor finishes to give a hygienic environment and comfortable working area for the operators. Enterprise Tondelli supplied a bulk glass depalletiser feeding into a Eurosistemi pressure less combiner to single line the bottles. The depalletiser is located in the warehouse for a “hole in the wall” supply to reduce ingress of packaging materials into the filling hall and thus potential contamination. In this area Enterprise also supplied and located the crown hopper and feeder so that there is reduced ingress of materials into the packaging hall. It also means that the depalletiser operator can mind both units. The Enterprise Tondelli master panel for the conveyor automation is also in this dry area. As high quality self adhesive labels are being used the labeller is placed before the filling operation. This ensures no condensation and thus better application with no moisture behind the labels and subsequent bubbling or mould growth. 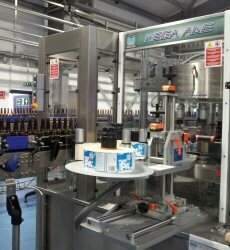 Due to the label length and speed of the line the labeller supplied by Enterprise from BRB Globus, Italy is fitted with an automatic reel change system. This consists of two independent labelling stations with one working and the other station in stand by. As the reel end sensor notes the end of the reel approaching the second station automatically starts ensuring no stopping for label splicing or change over – true non stop reel change over. The use of PSL labels increases the line efficiency, makes for a much cleaner environment and reduces machine wash down time. Enterprise have supplied a number of rotary self adhesive labellers to the brewing industry with either single or multiple heads for bottle dressing. At the discharge of the filler a water shower forms part of the filler supply to remove any fob on the bottle surfaces. To ensure no wet secondary packaging, a high volume, low pressure bottle drier from Eurosistemi was fitted by Enterprise Tondelli to remove any water droplets left by the water shower. These tunnels are especially important for transparent PSL labelling and can be retrofitted to existing lines for true bottle drying. Filler to cartonner conveyors supplied by Enterprise from Eurosistemi Srl are fitted with matt top chains to reduce noise and ensure longevity. To improve the operating environment, reduce slip hazards and reduce running costs no slat lubrication is used at all which is now common on glass lines. Originally Brew Dog packed it’s beer into cartons with top and bottom flaps. However Enterprise suggested to reduce packaging costs and increase line efficiency a Baumer Wraparound carton packer should be included. This has proved a positive benefit with ongoing savings on material costs alone of 30-40% whilst also reducing waste to the environment. The Flex line 540 wraparound Cartonner is just one example of the efficient and flexible end of line equipment from the Baumer manufacturing range supplied by Enterprise. These include wraparound cartons up to 70cpm and shrink wrapping up to 200 cycles per minute with auto reel change and for combined units to handle both. 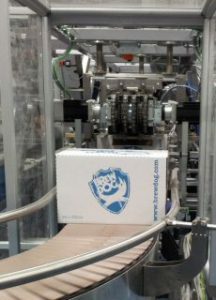 Finished goods either 12 or 24 pack cartons are then discharged via Eurosistemi conveyers to the warehouse. The conveyors are designed so that the completed cartons pass by the operator. Two localised operator panels ensure that the operators can access the main conveyor control panel sited in a dry remote area without leaving their stations. As a systems integrator the line was completed by Enterprise Tondelli using Eurosistemi conveyors to give an efficient line. 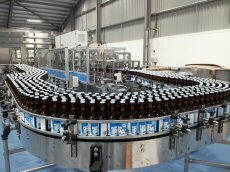 The bottling line project was managed by the UK office of Enterprise Tondelli based in Bedfordshire. This work is typical of the projects undertaken by Enterprise – “single machines to complete turnkey projects for the beverage industries”. With Brew Dog’s flair for marketing and development of some great beers, they will continue to go strength to strength.